I measured 3 cups of dhal into a bowl and then rinsed it through allowing 4-5 changes of fresh water until the water becomes clear. I let the dhal soak for around 30 minutes. 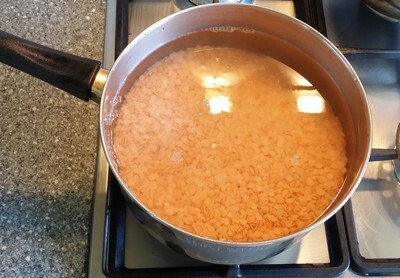 As the dhal soaks in water it absorbs water and expands. This helps speed up the cooking process and makes the dhal easier to digest. 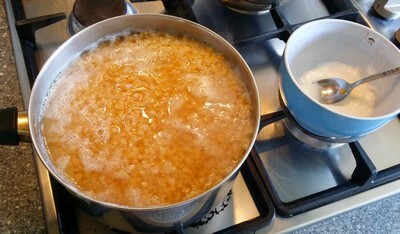 I then added water to completely cover the dhal so that there was around 2 inches of water above the dhal. 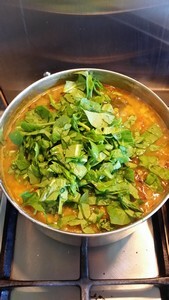 Next, I placed the dhal to cook on a medium heat. In a separate pan, I toasted a teaspoon each of peppercorns, cumin and coriander seeds and then ground them up. In my opinion, toasting and grinding whole seeds really makes a difference to the taste as it helps to release the aromatic oils from the seeds. When seeds are already ground and packaged they quickly lose this aroma and taste. I blended the ginger by slicing it up and adding it to the fresh green chillies along with some water. 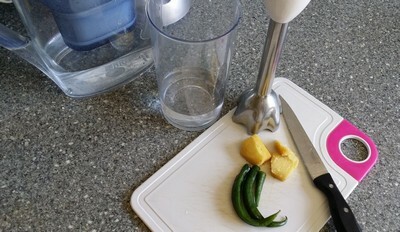 If you don't have a blender then just slice the ginger and use chillies whole. I peeled/thinly sliced my onions and finely chopped the garlic. If you've got a food processor then use them to save time. As you can see, I have blended the ginger and chilles and ground the cumin, coriander and peppercorns in my spice grinder. 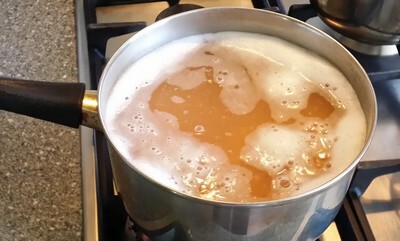 As the dhal comes up to the boil, foam builds on the surface of the water. I scooped the foam off as they are impurities, which may cause bloating. I did this a few times as the foam kept forming. I poured in the blended chilli and ginger and turned the heat to a simmer. Fresh ginger helps prevent bloating and spasm when eating dhal. For some people the high levels of fibre in dhal can be an issue. 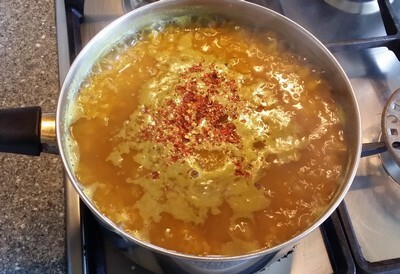 Next I added to the dhal a teaspoon of each of: Himalayan salt, turmeric powder. I also added a couple of bay leaves and a cinnamon stick. You may add more or less spices, it's up to your personal taste. 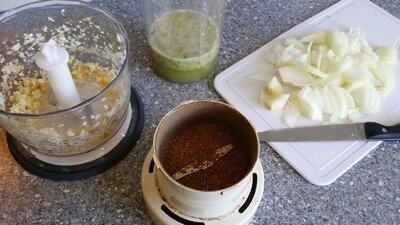 I also stirred in all of the toasted and freshly ground black pepper, cumin and coriander. I left the dhal to cook until it started to break down. At this point I prepared the dhal toppings. 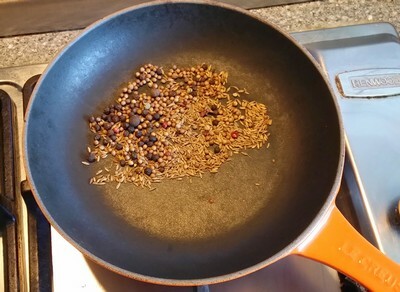 I toasted a teaspoon of black mustard seeds in my frying pan using no oil until the seeds start popping. 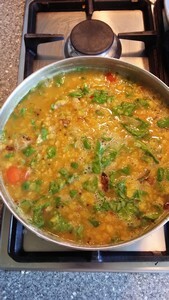 For the remaining dhal toppings, I melted around 2 tbsp of organic clarified butter into the frying pan. I then sautéed the chopped onions until they started to brown. You may use coconut oil if you wish but please do not use any refined vegetable-based seed oils which are highly refined and inflammatory. I made a space in the middle of the frying onions and stirred in the chopped garlic. 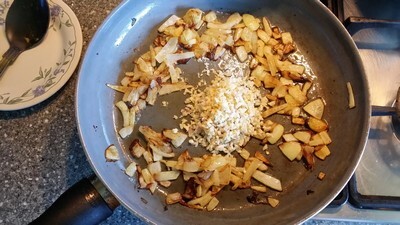 I add my garlic in after the onions have cooked a bit as they brown very quickly. I stirred the garlic and onions around in the pan until they were golden brown. 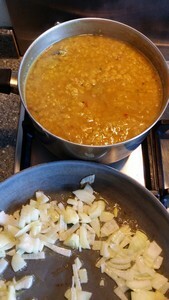 I quickly mixed the browned onion and garlic into the dhal. By now the dhal had broken down. 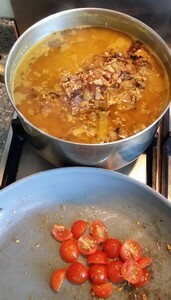 I then stir-fried the chopped tomato in the frying pan and added them into the dhal. I poured some hot water into the frying pan to deglaze and remove as much flavour from the pan and then poured this into the dhal. Finally, I added in some chopped baby spinach and let it cook for a minute before adding my chopped coriander and some freshly squeezed lemon juice to give it a zing. So that's it, my dhal recipe. At the end of cooking, I always check my flavouring and make any adjustments. If this recipe seems a little complex then simplify it by cutting down on some of the spices but do try to include adding turmeric, ginger and fried onions and garlic at the end along with the coriander. Adding leafy green vegetables like coriander, spinach and fenugreek helps to enhance the mineral content of this dish further. 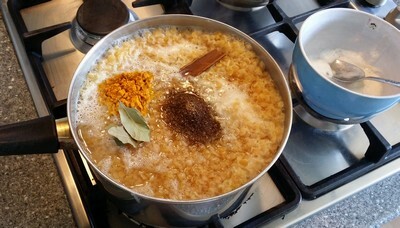 My mother's method of creating a bone broth for cooking her lentils in helped to mineralise the dhal. Split dehulled lentils do still contain some phytates, which bind to minerals like magnesium, iron and calcium. So try adding vegetable, seaweed or meat-based broths to add flavour and minerals to this dish.